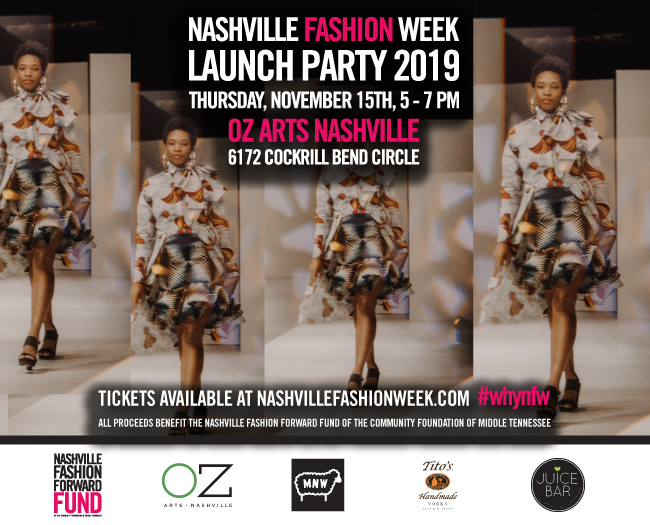 Join us for the Nashville Fashion Week 2019 Launch Party on Thursday, November 15 from 5:00 – 7:00 p.m. at OZ Arts Nashville at 6172 Cockrill Bend Circle. Be among the first to hear announcements about the ninth annual Nashville Fashion Week and celebrate all that is to come. Guests will enjoy two libations provided by Maison Noir Wines and Tito’s Handmade Vodka with delicious small bites from The Juice Bar. All Launch Party guests are also invited to attend “Ghosted”, the OZ Arts TNT event curated by Tony Perrin, following the party at 7 p.m courtesy of OZ Arts Nashville, our NFW partner. Perrin, a Nashville-based dancer, fashion/costume designer, graphic/print designer and owner/designer of Lock and Key jewelry, will investigate the unique, process-revealing creative collaboration of what it means to be "Ghosted" through live and pre-recorded performance of music and movement created by composer Aaron Walters and choreographer David Flores; large-format photography by Anna Haas of dancers David Flores, Erin Kouwe & Perrin himself wearing his own jewelry; and a series of shadow boxes jewelry displays. Tickets for this event have a $25 value and additional TNT tickets are available for purchase at OZArtsNashville.org. The Nashville Fashion Forward Fund supports the next generation of fashion industry professionals with ties to Middle Tennessee by providing a financial award and resources for experiential professional development opportunities to assist in career advancement within the fashion industry with proceeds from Nashville Fashion Week each year. Past recipients include Maria Silver, Brett Warren, Eric Adler, Ceri Hoover, Elise Joseph, Lauren Leonard and Julianna Bass.